SUNDAY JANUARY 27, 5:00 p.m.
1205 Dolley Madison Blvd., McLean, VA 22101. Teaching and performing at the Buckeye Dulcimer Festival in Ashley, OH. Teaching and performing at the Pocono Dulcimer Festival at the East Stroudsburg United Methodist Church, 83 S. Courtland St., East Stroudsburg, PA.
SUNDAY APRIL 28, 5:00 p.m.
SATURDAY MAY 4, 1:00 p.m.
SUNDAY MAY 26, 5:00 p.m.
SUNDAY JUNE 30, 5:00 p.m.
SUNDAY JULY 28, 5:00 p.m.
SUNDAY AUGUST 25, 5:00 p.m.
SUNDAY SEPTEMBER 29, 5:00 p.m. 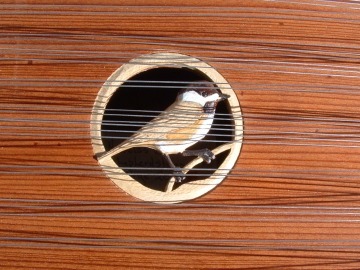 Detail of Jody's Compact Chromatic dulcimer, built by Nicholas Blanton.